Linda, bibliotekarie på Serieteket ger sin sista serierekommendation här. Vi tackar för tipsen! 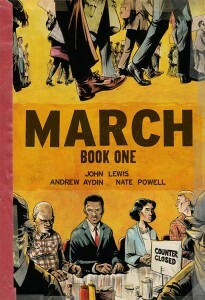 ”March: Book 1” av John Lewis & Andrew Aydin, med illustrationer av Nate Powell. ”Congressman John Lewis (GA-5) is an American icon, one of the key figures of the civil rights movement. His commitment to justice and nonviolence has taken him from an Alabama sharecropper’s farm to the halls of Congress, from a segregated schoolroom to the 1963 March on Washington, and from receiving beatings from state troopers to receiving the Medal of Freedom from the first African-American president. 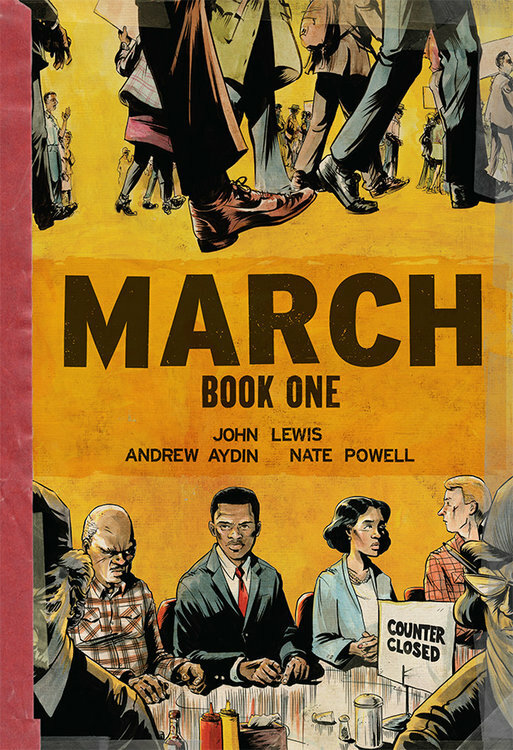 Now, to share his remarkable story with new generations, Lewis presents March, a graphic novel trilogy, in collaboration with co-writer Andrew Aydin and New York Times best-selling artist Nate Powell. March is a vivid first-hand account of John Lewis’ lifelong struggle for civil and human rights, meditating in the modern age on the distance traveled since the days of Jim Crow and segregation. Rooted in Lewis’ personal story, it also reflects on the highs and lows of the broader civil rights movement.